Biwako Floating School uses its "Uminoko" food service as an opportunity to promote food education through the following activities. The "Uminoko" food service provides food that incorporates various local ingredients including Omi beef steak and clam miso soup. Food is enjoyed in a fun atmosphere that enables children to experience the local food culture while communicating with their friends. During "Food Education Time 1" (before lunch on the first day), food leaders can participate and help prepare or clean up. 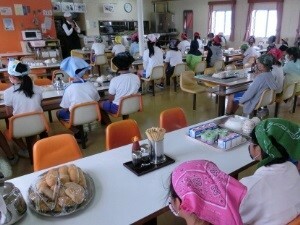 During "Food Education Time 2" (before dinner on the first day), an explanation is given on the menu and ingredients. 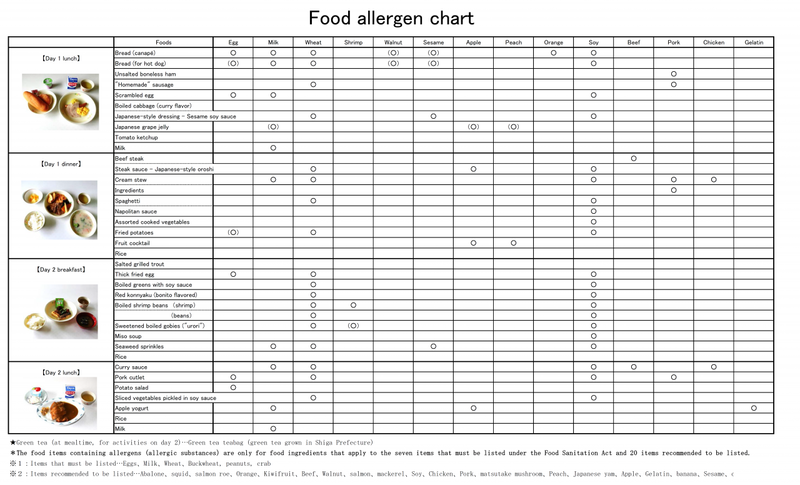 For individuals with allergies, please have a guardian check the menu and ingredients chart and the "Uminoko" food allergen chart. Changes on the food menu are basically to remove that food item. Changes are possible to the food change menu; however, it is impossible to provide completely allergen-free food due to the restricted cooking space.